I needed a birthday cake, a special and unusual one, to help celebrate the first birthday of Cornbread Suppers, our weekly conviviality session. 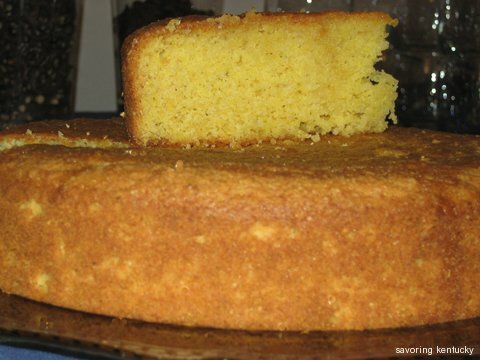 The cake needed to be a cornmeal cake. I made Coffee Butter Almond Ice Cream with our fine country milk and cream, so almond seemed the right companion flavor for the cake. In the ethic of Cornbread Supper, the game is making delicious food from whatever is on hand. I had on hand some aging almond paste that I wanted to use, and I wanted to use the entire little roll, not just a portion. I also fancied the idea of making the whole cake in the food processor, which eliminated the separation of the egg yolks and whites. So I searched for "cornmeal, almond paste," and found a beautiful Martha Stewart recipe for Almond-Cornmeal Pound Cake. What I really needed was confidence to put almond paste and cornmeal into the same baking pan, and Martha Stewart gave it to me. I proceeded to change the recipe completely, based on what I had on hand, and how I wanted the end product to taste and feel. My most informed critic pronounced the cake "delicious with the ice cream," but my observation says it could be a bit more moist. Spray a heavy 9-inch layer pan with non-stick spray. Alternatively, butter the pan thoroughly, line the bottom with parchment paper trimmed to fit, butter the parchment paper, and dust all over with a heaping tablespoon of flour, until lightly coated. Turn the pan upside down and empty out the excess flour into a sink or garbage bucket. Turn the oven on and set it at 325 degrees, or, if digital, 335 degrees. Assemble a food processor with an ordinary "knife" blade. Pulse in a food processor until consistency is like coarse sand, and the almond paste and sugar are well integrated. Whir in the food processor until well blended, about 1 minute on medium high. Pour mixture into prepared pan; smooth and swirl the top. Bake 45 - 55 minutes, until golden and well-set. Check with a toothpick if you want. Cool in pan five minutes, and then gently run a thin knife around the outside of the cake to free it from the pan. Gently turn upside down onto a rack, and then back upside down again onto a cake plate. The cake will be upright, with its crusty top facing up. Make an Amaretto-flavored simple syrup. Bring to a boil 1/2 cup organic sugar and 1/2 cup water. Remove from heat and cool a minute. Stir in two tablespoons Amaretto. Using a toothpick, poke holes all over the warm cake. Spoon the warm syrup onto the cake top and allow it to sink into the cake. Cool completely. Dust with confectioners sugar if you like.